The trend for open plan living has gained momentum in recent years due to the benefits it offers; the lack of visual barriers so the area feels spacious, light flows through more easily, and it creates a space that is more conducive to group entertaining. The modern home has a variety of functions to fulfil. In one living area, we might cook, entertain, dine, socialise or relax with a glass of wine and a movie. We might do our tax returns here, or the kids might use this space to play with their toys or do their homework. So, if there are no walls, how do you separate these different areas, yet still retain the open, spacious feel? One way to cater for all these household demands within one open space is to create zones. Zones are visual signposts. They work by separating the room according to the various functions within it. And one tasteful way to do this is to choose flooring that defines the zones. Zoned flooring creates a visual clue as to how the separate areas work together. 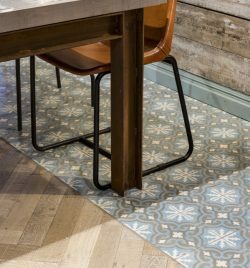 The change of flooring to delineate the change of function – whether it is eating, cooking or relaxing – directs the eye to see each section of the room as a different space, with a different function to another. It is a clear way to show where one area ends and the other begins. This stylish yet functional way of managing space has long been used in commercial spaces such as fashion stores and restaurants to create different areas within one large space. And we’re seeing it more in private homes too. A dining area with dramatic dark stone flooring, for example, will clearly separate it from the clean white porcelain flooring of the cooking area. In a large kitchen diner, you might contrast a concept ceramic tile with a slate floor tile to showcase the social areas of your kitchen. 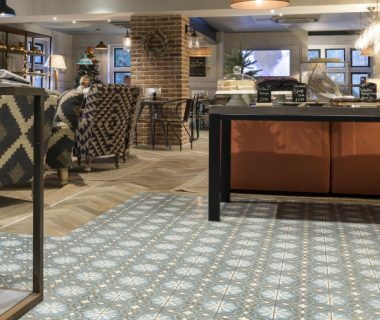 In an open plan family home, the living area might be laid with a sophisticated limestone that makes the area look smart and formal, while the children’s play area is colourful and fun with patterned encaustic tiles. Both coexist very happily in the same open plan space. This is common in bathrooms too. A walk-in shower might have a mosaic tiled area but with a large format ceramic tile placed elsewhere. Zoning a space has other benefits besides indicating separate functions. It also determines where the key pieces of furniture will go, and show where light, power points and light switches should be situated. With zoning, you can create a space that is seamless and unified, while also having the visual clues to identify separate areas. 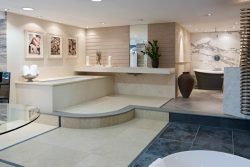 This can make a big impact in creating a successful property design project. Take a look at our full range to see how you can zone your design project.